Our range of products include industrial biogas plant. We have wide range of Bio-Gas plants built with different materials for different requirement. Our experience and expertise in the field over a period of time has gained us the reputation for reliability. The plant can be fully underground, semisubmerged or fully above the ground and are designed for using to convert organic waste like food waste, kitchen waste, green leaves etc. Rane Mysore, HAL Bangalore are few our satisfied clients with a good track record. 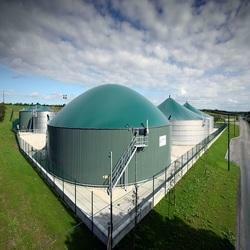 Looking for Biogas Plant ?